I have trouble with the "it have too look realistic" for its proportion and shape, when the head looks to me even more cartoony than in the games... It create a bizarre mix that doesn't works well for me. It's too plush or toyish, and at the same time with a too pseudo-realistic body-shape. I really feel that they should have done something different, and a bit "the opposite", making maybe a bit less realistic the "body" in itself, and playing more with the head (like many of the good fan design done). It's especially sad when Detective Pikachu managed to do the same basic thing (playing with "realistic cartoon creature") more successfully. But at least, it's not the elderitch horror that I feared it would be. So it's not all bad ? Now let's see if the movie isn't bad in term of story and gfx, now that I know that the universe (or at least what we know of it) and the main character design aren't my cup of tea. Personally, I really liked this issue. It was kinda "slow" but the set-up was fun and how they are working on Eggman and Starline, especially how they are showing the first hints of possible future friction (as Eggman doesn't care that much about Starline, and that Starline is way more pragmatic and methodic than Eggman). Also, I liked how we get to see the preparation of the plan, and I really feel that here, the pace will help the climax. I also liked the "joker" bit about Eggman, about how just carpet bombing Sonic wouldn't be interesting for him. And honestly, even if I'm a big fan of post-reboot Archie, I'm not really negative in the comparison between the two, because the real moment when Archie outshined was in some specific arcs and in the Universe... In other moment, it was kinda meh, especially during the Gaia Key Search (it had some good issues, though). Most of my issues I think will be solved by the possible future arrival of more secondary-character driven side-issues, so I'm not really bothered by them. I don't think that the "robotomy" actually refer to anything in particular, and that it was just a joke about an over-the-top dystopian proposition and just a joke with Lobotomy (which isn't quite scientifically exact as in Lobotomy, tomy mean "the removal of". But I don't think that was meant to be scientifically correct). But the name is still better for me that roboticization, as at least it's easy to write. So I still hope for this name to be reused xD Or any name that is simpler. I also liked their sibling-like/friendship relationship in 2006. Even if they didn't got that much time to interact one with the other, I kinda saw in the game how much they cared about each other. Blaze going to help Silver being the first thing she got to do when they got separated, Silver being heartbroken when she was sealed away even thought his future was saved… That was for me the best part of 2006. And I think that for many people, that created something interesting between those two characters. For some it was shipping. For some other it was a platonic "sibling" relationship, or just a friendship (these two visions are how I see it, personally). I can (theoretically) understand why some people don't really feel that relationship in 2006 (even if I think that we can portray how work a relationship within the small space we can get for that in a Sonic game), but I really think it's there in the game, and I can understand why many people liked it, as it was sweet and somewhat tragic. I think that's why the fanbase really have kept this link and liked it. It's not just in the "shipping" thing, I remember that many Silver related fanwork involved Blaze in some points (for instance that nice Silver Worlds Collide fangame), same for other things. (and they are also kinda linked by both being ennemies of Eggman Nega, meaning that the link never was totally severed and they never become totally unrelated. And I would love that being handled in the comic-book, especially if they play with the two different origin stories of Nega, there are a lot of thing possible with that). And it's encouraged by the fact that even if they didn't get much time to really interact (which isn't surprising as there isn't many substantial interactions now), the ST link them together in many games… So there is everything for this link to be popular. Basically, there is still a "link" between them in a meta way, now what is missing is exploration of it story and character-wise. Moreover, I think that linking their two is also interesting personality wise. They have common point yet are opposite. Even if both are serious about their mission, and a bit akward around others, they are really different in term of personallity (even more in the comics). While Silver is cheerfull, Blaze is more reserved. Silver in an extrovert, Blaze is an introvert. Both can help each-other and make the other grow. They can appreciate each-other yet might clash when it's interesting. And I think that the tropes of "even if they have rebooted the world and lived through an entirely different life, some link is kept" have some charm, even if it's a classic. I don't think that we need a reboot, nor a "Bible" either. Just some less contradiction and a better writing. They just should have guidelines that are large enough to be able to do what they want and to keep the diversity of the franchise (that can have colored wacky game as much as more serious ones), but that are organized enough to be sure to avoid contradiction. And I kinda disagree about some of the elements : - An active geography is fun, but not needed for such a videogame serie. Sonic isn't and shouldn't be meant to be a serie with a strong continuity. So I think they should more have some guideline to make sure that it's kinda working together, but two map that doesn't look the same aren't such a problem for a game like Sonic. It's more the basic rules of the world that should work together. - The big difference between American and Japanese Sonic wasn't a weakness of the serie. Not everybody liked it, but it's not like Sonic's old american continuities are seen as the same as other cartoon and comic for other japenese continuities. They have a lot of fanbase and many parts of them are seen as part of what is Sonic. And TBH, trying to advocate that when nowaday the Sonic Team is actually taking in leash other continuities to make sure that everything works kinda the same seems to me a bit anachronistic. And TBH, even if we got some contradiction in Forces (the last relevant game), I don't feel that they are the biggest problem of the game or even the biggest risk for the future : for me it's more everything becoming to same-y and repetitive. I wouldn't be against some kind of user-facing encyclopedia though. They are fun. I like the leadership idea for Amy, but I wouldn't mind that much if they tried something else either. In Sonic Adventure, not everything in her arc revolved around Sonic, and she was mainly driven by willing to help a smoll bird. TBH I could imagine Amy doing that, just helping people in her life while being more less nomadic than Sonic… But I also like the idea of her being now more "mature" than before in that she does the kind of hard work the other wouldn't do, it make the evolution visible. It's not like it's the only idea possible to work with her, it's just that it is imo a pretty nice one. I also think it suit how the character worked in recent game, like in Forces (and how Boom made evolve the perception of the character with Amy being more proactive in field that the other would have find boring) as even if she wasn't the leader, she had a role that we can make evolve to the one of the "actual leader". Basically, I like how this vision kinda tie how she was in Adventure and in the latest games, so it's nice. That's why I especially liked the issue where he was with Bunny at Adabat, because the little flashback with Tails & Bunny was really cool way to focus on the character (sure, Sonic was still related to that, as Sonic helping him drived him to do the same, but that wasn't a problem for me as it was a really nice portrayal of his character). That's still sad we only got one issue of Tails characterization. TBH, Sonic not wanting to kill Eggman is also logical with Sonic japanese personna, where he doesn't see Eggman like a suprem evil or anything. I think that the goal of the storyline is to play with the change of dynamic between Eggman and Sonic that Forces introduced. (With a more "evil" Eggman). Or maybe that's a way to go back to a more pre-Forces or even Sonic X-y (or pre-Colors, that was the first game introducing concept like slavery in relation to Eggman) vision of Eggman, with some parts of Mr Tinker remaining, IDK. Anyway, I'm interested to see where it's going to. TBH, Sonic Forces was announced 18 month before release, but Generations was officially announced in April 2011 (and leaked way before xD) IIRC. So I'm not sure that we would know necesserally much by now if a new Sonic Game was in developpement. So for me, everything is possible, I think that Forces have been announced earlier to have an announced for Sonic's anniversary. I don't especially think that we will or won't get a new game for 2019, I'm pretty neutral on that question (as we don't have any clues for the moment), but if we got one, I'm pretty intrigued of what we would get, with all the change at SEGA and stuff. I would say that it's not just a question of "US vs FR", but also a question of different objectives of comic book. Here, the art, the dynamism is important too. Honestly, even if I love french comics (I basically grew up with them), I wouldn't say that their style is a great fit for what Sonic is. It's often pretty wordy, and lack the creativity in the layout that the Sonic Comic and a lot of other comic-book have. 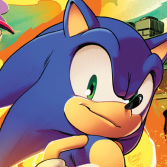 Yep, the Sonic comics have less content, but except in some case, they are often way more fun too look at. I mean, they are page with even fewer panels/word in some Sonic, but that are pretty memorable and fun (I would even said that many of the best pages of the comic book only have a few panels). It's not a question of page number, and "number of stuff that happens". I feel that this impression is more related that they were more about reintroducing the global ambiance and the character, than telling a big story. I also feel that some page with only action are more related to that than the way the layout is done. That kind of annuals are a really cool idea, imho. It's nice to try small story about different characters, with new and old writers, new and old artists, etc. That's something that I really loved in the Worlds Unites side-stories (I actually preferred them to the main action of the crossover), that got pretty nice and different ideas. I hope they'll do one each year, and with different folks each time, because it have a lot of potential. I'm really hyped to see what they'll do, it makes me really curious. (and as I'm already pretty curious about the Starline storyline, I'm pretty interested by Y2. Honestly now all I miss is having 2 comics per month like during the Archie era xD) And I'm pretty happy that we'll get a comics illustrated by Jon Gray again after so much time xD That's nice. Just a bit sad that we don't get an Aleah Baker story, I really loved her writing style, more focused around characters developpement. But it might be for another time !